By most accounts, crude oil prices are still nearing their March lows. 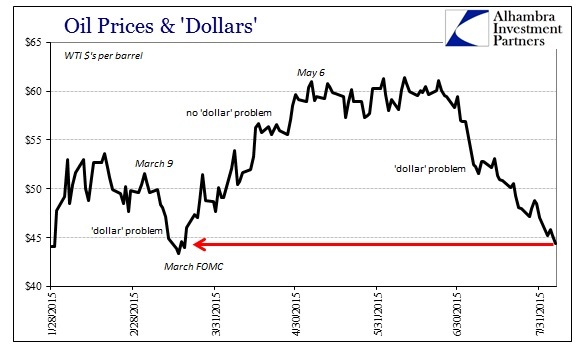 That would suggest that this version of “dollar” turmoil might be yet working its way toward levels of disorder previously seen in that last episode. That is misleading, as even crude prices are appreciably more stressed now than they were in March. From that, it follows that other “dollar” indications would also signal that wholesale conditions have surpassed those prior lows, meaning that we have been treading new warnings for some time. It starts with the spot price of crude, which at $44.50 is a little more than a dollar above the March depression. Examining the rest of the crude “complex” beyond the shortest maturity reveals just how much more there is to oil’s contribution to the “dollar” interpretation. 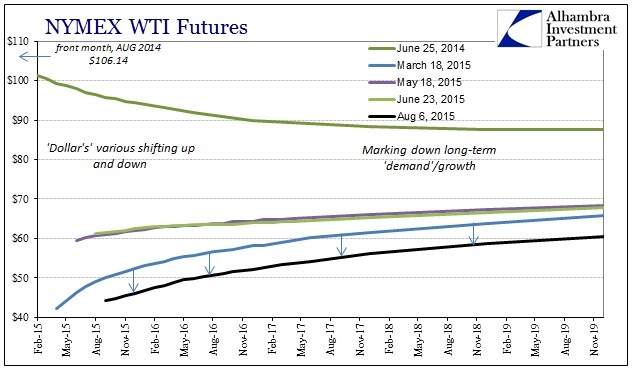 The entire WTI curve, only minus the very front month, is significantly below what it was in March. More importantly, it is much, much flatter in relation. That suggests the limitations of contango as a matter of hope for a quick and more durable rebound which have succumbed to the reality of the restarted “dollar” dysfunction. Again, we see the interplay and intersection between finance and the “dollar” and economic expectations and physical commodity fundamentals. 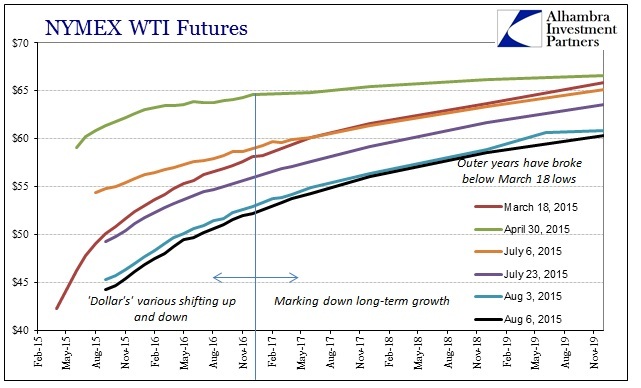 When crude was suppressed in March by mostly the financial side at the front end, the back end built enormous contango as a means to express that more hopeful outlook that the “dollar’s” travails were a short-term disruption to be overcome in relatively short order. The attractiveness of contango was in that storage possibility, and it seems to have shifted around July 6 (or one of those days in early July). The curve in this renewed “dollar” fight is, again, far flatter and thus expunged largely of those quick turnaround projections. Some of that is surely due to storage capacity issues, as space is running out; but that, too, is the same type of interplay between fundamental outlook in supply and demand and financial factors which affect pricing all down the curve. In short, the “dollar” “won” the argument in that the negative view of the short end and has now brought the rest of the curve down with it – by a lot. This is revealed fully when recalibrating the curve for calendar roll, where all but the front month is seriously underneath that prior March low point. 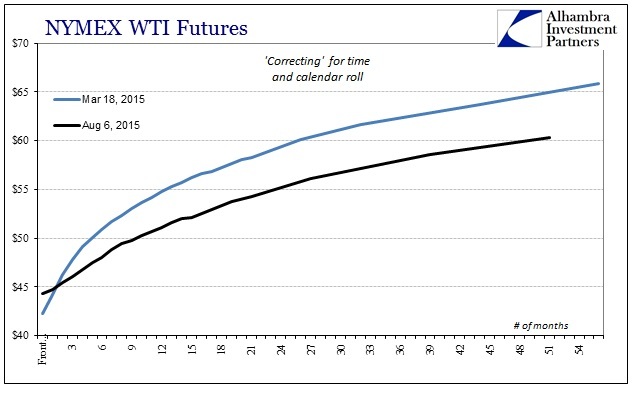 There is still contango in the current curve, but the difference or relative change is what is significant. That view is expressed not just in crude oil prices, but copper (which is pretty tame this morning, sticking at multi-year lows so far), gold, and the major currency exposures. 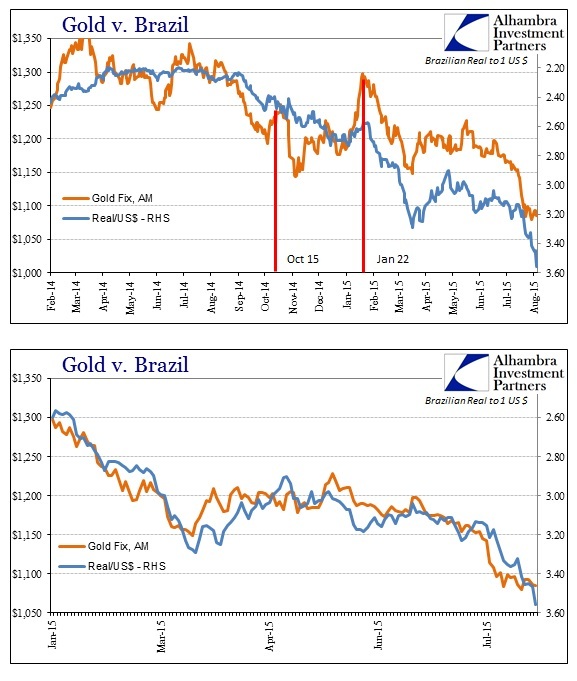 Like copper, gold is angling to remain near its multi-year low which is still in close proximity to the Brazilian real – finance of the “dollar” connecting all these various pieces. Like crude, the real has devalued much further than when at the March FOMC inflection. In the past two weeks alone, as these ripples of “dollar” disorder flowed widely, meaning more sustained and widespread problems for the global “short”, the real has sunk from almost stability around a still-problematic 3.10-3.15 cross to below 3.55 this morning (and below even 3.57 at its worst). 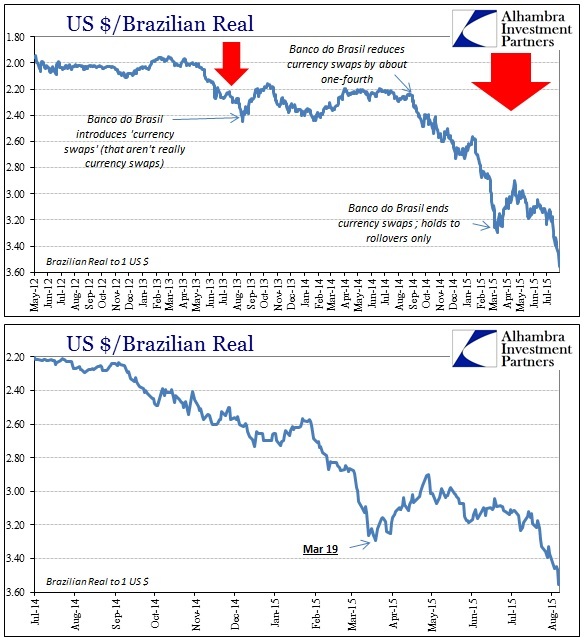 As noted last week, the move initially down to 3.20 in March has heightened financial pressure on Brazil when it is already reeling from other related fundamental factors (global recession that has accompanied all this); the country is in so very poor shape to really handle this next leg down which won’t likely be fully felt for a few months yet. Brazil is, unfortunately, not alone in its misery as currency financing measures are relaying far more stress globally. The Russian ruble, in the past two weeks like the real, has dropped to 65 to the dollar. 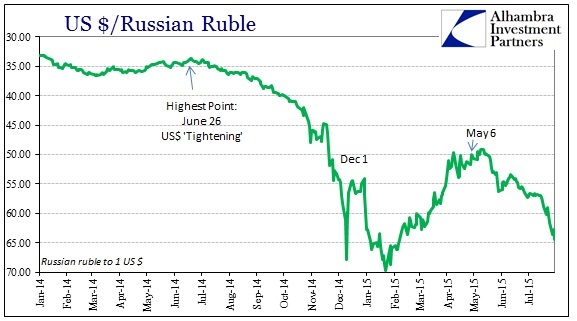 Recall back in early December, at the start of another of these “great” “dollar” affairs, it was a decline from about 45 to 67 that nearly collapsed the Russian economy. Despite all assurances that the Russian central bank had successfully dealt with the ruble crisis, hiking interest rates all the way to 17%, it misread the problem in orthodox terms and understanding, cutting its benchmark by 2% in January and then further. Yet, here they are again with the ruble threatening the same disaster as December as only the “dollar” can, like crude, determine the intermediate and longer-term direction. Even the Swiss, having already taken a beating via “dollar” turmoil, have seen the franc devalue again threatening parity in the past few days. 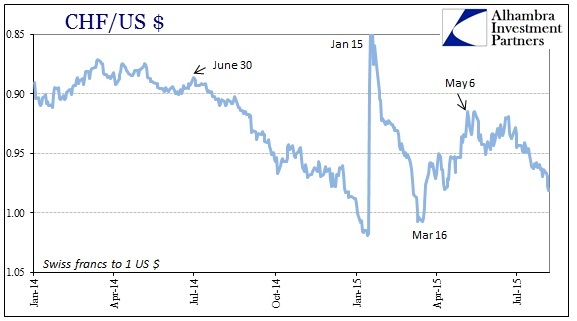 By broad survey of “dollar” conditions, the difference between early August and mid-March is far more than time. It was, seemingly, time that was engineering that intermissive period of hope as a respite against the “dollar” storm. In other words, by credit and funding market accounts, the Fed wouldn’t make the situation worse (thus the March FOMC meeting as the inflection) and that any time afforded in that direction might allow the global economy enough space and relieved pressure to find itself a turnaround – that the “dollar’s” worldwide destruction to that point was suggesting only a temporary “slump” that could, without policy mistakes, correct on its own. This renewed and in most ways worsened reaction suggests, as I wrote earlier this week, that this engaging “slump” is something far greater that still, now into August 2015, hasn’t seen its bottom.